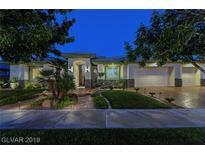 Below you can view all the homes for sale in the Willow Creek Summerlin subdivision located in Las Vegas Nevada. Listings in Willow Creek Summerlin are updated daily from data we receive from the Las Vegas multiple listing service. To learn more about any of these homes or to receive custom notifications when a new property is listed for sale in Willow Creek Summerlin, give us a call at 702-323-5933. Perfect for family or entertaining w/multiple gathering areas, beautiful courtyard entry w/pavers, fountain, executive office, quality construction, gourmet kitch equipped w/lrg island/brkfst bar, top of the line SS appliances, 2 dishwashers, an abundance of custom cabinetry & opens to the roomy family rm w/trey ceilings MLS#2087000. Luxury Homes of Las Vegas. Luxurious formal living rm w/vaulted ceilings, an office, lrg family rm w/FP & French doors to lushly MLS#2073032. Luxury Homes of Las Vegas. Custom Lighting, Custom Cabinets, Crown Moulding & Built Ins. Nest Thermostats. MLS#2053771. Realty ONE Group, Inc.
Upstairs master w/wet bar, hers & his vanities & closets, large corner shower, & Kohler jetted tub. 2 generous ensuite bedrooms upstairs. MLS#2048237. Rob Jensen Company.